You can enjoy an unrivalled cruising experience on Coniston in the steam yacht Gondola. Owned by the National Trust, the present day Gondola was built in 1980, as an exact replica of the original Gondola which sailed in Victorian times, and her passengers can enjoy all the luxury and atmosphere of a bygone area. Gondola is a wonderful way to enjoy some nostalgia in comfort, while also getting the chance to explore the beauties of Coniston Water. The original Gondola - which spent many years on the bottom of Coniston Water - set sail in 1859; although it was raised, the timbers were not strong enough to survive the rigours of restoration, so we now have the pleasure of sailing in an identical replica. The replica Gondola shows how the Victorians had a taste for luxury and elegance! Gondola has a colourful history which can be retold by her enthusiastic crew. Even more enjoyable, as Gondola calls in at Brantwood House, you can make a full day trip by combining your cruise with a visit to Brantwood House and Gardens. And of course you can enjoy that sense of elegance as you cruise along the Lake, enjoying the magnificent scenery and relaxing in the luxury of the sumptuously upholstered saloon. 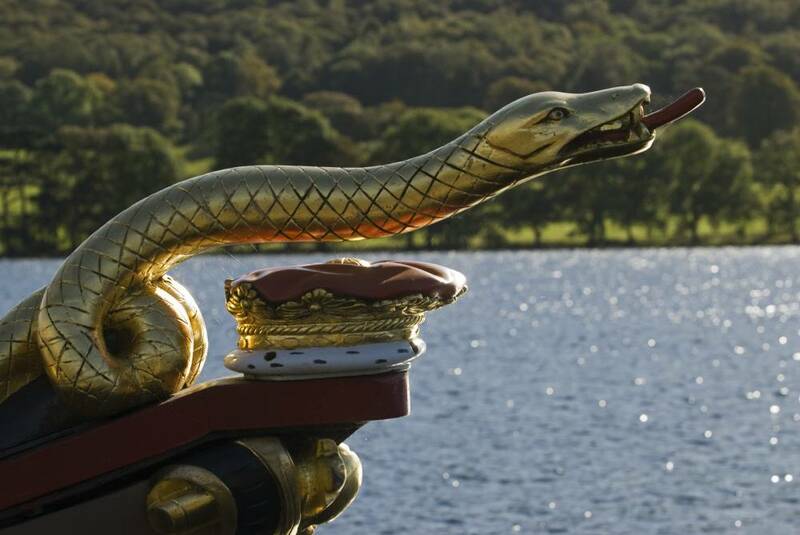 Even though Gondola is a replica, it is a fundamental part of the history of Coniston, and provides another enjoyable Lakes experience. Every year between April and October Gondola operates a seven days a week service from Coniston Pier to Brantwood jetty, a round trip of about 45 minutes with up to 86 passengers on each trip. If you wish, you can combine your trip with a beautiful walk along the brand new National Trust footpath through the fabulous grounds and walled garden of Monk Coniston Hall by disembarking at Monk Coniston jetty (every weekend, weather permitting). The path connects with walking routes to Tarn Hows through the beautiful Monk Coniston estate, renowned for its arboretum. This new permissive footpath completes the second phase of the Monk Coniston and Tarn Hows project which has been supported by a £450,000 Heritage Lottery Fund grant (and £20,000 Lake District Sustainability Fund grants.) A walk leaflet is available on board Gondola or from Coniston Community Tourist Information Centre. 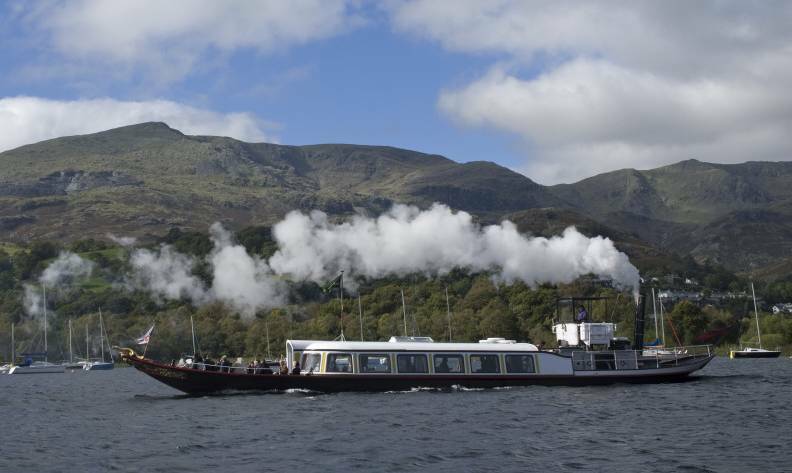 Steam power for Lakeland steam yachts was always provided by coal, but Gondola has broken with tradition by using a more eco-friendly form of fuel: waste wood chips, the only carbon neutral fuel. This saves about 95 tonnes of carbon dioxide each season, since Gondola now emits only 10% of the carbon dioxide it formerly spewed into the atmosphere. Even better, these logs are made in North Wales, so the fuel used to transport them is much less than it was for the coal - which came from Russia! All sailings are weather permitting. If the weather looks doubtful, please call 015394 41288 to check whether Gondola is sailing.